When the Princess of Nova accidentally poisons herself with a love potion meant for her crush, she falls crown over heels in love with her own reflection. Oops. A nationwide hunt is called to find the cure, with competitors travelling the world for the rarest ingredients, deep in magical forests and frozen tundras, facing death at every turn. Enter Samantha Kemi, an ordinary girl with an extraordinary talent. Sam's family were once the most respected alchemists in the kingdom, but they've fallen on hard times, and winning the hunt would save their reputation. But can Sam really compete with the dazzling powers of the Zoro Aster megapharma company? Just how close is Sam willing to get to Zain Aster, her dashing former classmate and enemy, in the meantime? The Kemi Potion Shop is falling apart, never mind business not being as bustling as it once was. Synthetic potion makers have taken over the market, driving the little family owned business into disrepair. When Sam and her gruff grandfather are summoned to the palace, the elderly alchemist and his protege called to action to find a cure for a toxic love potion. It seems Princess Evelyn has been poisoned by her own hand, concocting a love potion for an unrequited crush but consuming the mix and falling in love with her own reflection. Her life is in danger and teams from all over Kingstown have been called to participate in The Hunt, a dangerous adventure into the Wilds to obtain the ingredients needed to create a cure. Along with Finder Kirsty, the odds are stacked against the duo who not only have an exiled royal turned rogue to contend with but Zain, Evelyn's own crush and heir to the Aster synthetic potion empire. The Potion Diaries was a lovely mix of fantasy, adventure that reads more as a mature middle grade, than young adult series. 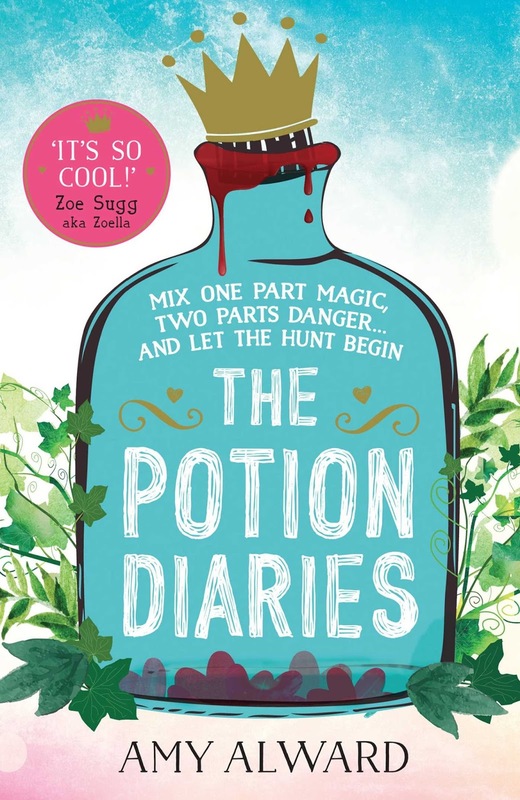 It follows the story of Sam, apprentice alchemist who lives in the family owned potion store. The Hunt offers Sam a chance for the Kemi Potion Shop to be financially viable once more, provided she finds the cure first. A fantasy modern day setting, it was lighthearted and fun, but the characters seemed far younger than they claimed. The few chapters from the Princess Evelyn's point of view were snort worthy. The potion intended for unrequited love, somehow she ends up consuming it herself and falls in love with her own reflection she affectionately calls Lyn. The Princess playing coy with the mirror, claiming she's found the love of her life was ridiculously funny and only added to the overall lightheartedness of the storyline. The romance was the only down point and was used as a tool to add further interest. Zain didn't seem all that genuine and often put his father's wishes and Hunt before Sam. She often questions how genuine he is and whether his interest in her was little more than furthering his family's investment in the competition. Team mate Kirsty was more of a vested party than a friend, and although she claimed to be one of the world's best Finders, she let the inexperienced Sam do most of the work instead. She didn't add anything to the storyline and wouldn't have been missed, apart from driving to each destination. Amy Alward has crafted a fun and lighthearted read for fans of middle grade fantasy, treasure hunts and adventure. Highly entertaining and looking forward to continuing on with the series. Really enjoyed it. It's so incredibly fun and entertaining Nirvana, I really enjoyed it. Ugh, why does every book need to try and have a romance storyline? Evelynn sounds quite amusing though! Seems like a fun story. It was fabulous Lauren, the Princess was absolutely hilarious. Her flirting with her reflection was snort worthy. It was only the romance that let me down, but otherwise it was a brilliant, fun adventure. I really love middle grade Naban, something fun and not too heavy that will entertain your socks off. This one is it. I really enjoyed it and looking forward to the next book in the series. Can't WAIT to see what you think of it. I have the book too and I can't wait to get started with it! It looks amazing but I'm not really into middle grade but I will try it out! It's aimed towards young adult, but personally I think this one falls under both really. It's clean enough to be middle grade or early young adult. Regardless, it was awesome. I flew through the pages and it was just so incredibly fun and entertaining. Really looking forward to seeing what you think Naomi and hope you enjoy it as much as I have. Aww, sorry to hear it didn't work for you poppet. They are the reasons I actually enjoyed it. I've been reading so many heavy themed young adult lately, that this is exactly what I needed. Something light, adventurous and ended up really enjoying it. What an amusing premise! Oh and why does it always have to have a romance? Boo. The romance is thankfully just a small aspect though Joy, you'll hardly notice it really. I'm already looking forward to book two. This sounds like it could be heaps of fun to read but that's about all I can say. Not sure if I want to check it out. Modern fantasy isn't a setting I read often. Plus I'd probably get annoyed with the romance because it doesn't sound as it was developed well at all. The romance isn't, but the main storyline is so much fun, really adventurous. Such a nice change from all the heavy themes in young adult at the moment. Definitely give it a try though, it might really surprise you. That sounds like a very entertaining book to read! I've never heard anything like it! Me either Florentine, it was ridiculously entertaining. I hope you enjoy it as much as I did. I had such a bad time with this. >_< MY BAD! I read too much dark heavy fantasy obviously and this just diiidn't work for me. Too much happiness. UGH. WHERE IS MY DEATH AND DESTRUCTION? So glad you enjoyed this one though!! YAY! Poor poppet, it sounds as though you've lost your sense of fun. Ever since reading Percy Jackson, I've really fallen in love with middle grade / young adult fusion and just really loved this one. So sorry you couldn't have enjoyed it more. Will you keep going with the series? I felt totally the same way about the romance. It annoyed me quite a lot, it just seem so unreal and fake. It could have been even better without it, but glad it didn't impact too much on the main storyline though. Really enjoyed it regardless. This definitely looks more MG then YA anyway so I don't think I would be too surprised by the maturity levels of the characters. The romance sounds a little off-putting but I like the sound of the book so I'm going to go add it to my TBR! It felt more middle grade too Rashika, but I really enjoyed it nonetheless. I know how much you love adventure middle grade as well and can't wait to see what you think of this one, my fellow cape wearer. It's not the characters, but storyline that gives it that middle grade feel. It's one of those books that I think falls in between middle grade and young adult, but it's awesome regardless. It's ridiculously silly in places, but it's just what you need to immerse yourself in something fun and adventurous. I'm glad to hear that you enjoyed this one, Kelly! I've been looking forward to reading it because it sounds like so much fun. I'm a little nervous about it reading more like a MG book though and the things you said about the romance don't particularly appeal to me. Still, I have a copy, so I'll give it a shot and I hope I will like it as much as you did. Me too Nick. It's really fun and light, making such a nice change every now and then to pick up something that's purely entertaining. Looking forward to seeing what you think of it. Sounds like a fun light hearted fantasy, although I'm glad that you picked up that it's MG! With the characters seeming younger I might struggle through this read, I don't know. Thanks for the lovely review though Kelly. The characters aren't middle grade, but it certainly feels as though they are though Jeann. If you're looking for a lighthearted read, you'll really enjoy this. There's not much depth, but it's funny and hilarious in places. Great review Kelly! I enjoyed this one too - it had quite a hilarious tone in some parts (especially with the Princess/Lyn drama), though I can definitely see where you're coming from with the romance and Kirsty. It didn't add all that much to the storyline, especially Kirsty. For someone who was supposed to be this awesome Finder, she was incredibly lazy and clearly just in the hunt for the money or fame. I still enjoyed in nonetheless though. Oh, this sounds like a lot of fun! I initially thought it was young adult -- and I think if I went into this expecting it to be aimed at an older audience, then I would've been disappointed. Still going to give this one a chance though! And besides . . . treasure hunts? Yes, please! ;) Lovely review, Kelly. It's a very young young adult, but more suited to middle grade I think. If you love adventure type treasure hunts and lighthearted fantasy, I think you'll really enjoy this one Kara. Looking forward to seeing what you think of it. Great review Kelly! :) I'm even more excited to read this one now! It sounds ridiculous, and it had me internally asking, are you kidding me? But it was ridiculously funny, especially at seeing the Princess playing coy with her own reflection and batting her eyelashes. Was just what I needed, so entertaining. Oh, I'm glad you enjoyed this! I had a few issues with it, myself, and didn't end up liking it all that much, but I agree that it is much better suited to a MG audience. With a few edits I feel like it could have settled into that age group much more easily, as the characters just didn't act like 16-17 year olds. And the romance was fairly off for me, too. Not sure where the sequel will take things, since I didn't really feel the need FOR a sequel, although there were a few little things that came up unanswered. Also, I do wonder how Evelyn drank the wrong potion- simply a mistake? I'd love it if there was a conspiracy, there. I've seen this around so many blogs and I'm still torn about whether it's something I'll read. The overall view seems to be that it's quite fun, so perhaps it's one I'll pick up if I see it at the library :) Sometimes it's nice to read something lighthearted! This sounds like a very cute read! And although it is suited towards the middle grade audience, it seems to have quite an interesting concept, so I may read it if given the chance. Thanks for sharing your thoughts! OH YES! This sounds absolutely amazing! Let's kick the romance to side for just a damn second okay authors?! But if you were still able to enjoy it with that minor flaw, then I definitely need this! Adding it to my TBR asap! Despite being a romance junkie, I so agree that not all books need to have romance in them. What happened to books that were basically just about the fun and the quirkiness? :/ Ugh. I enjoyed this as well. It was definitely more MG than YA though, but for once that didn't bother me. It was just such a fun read and so easy to get through. I'm sure I'll be reading the next book in the series, really hoping it is just as much fun.